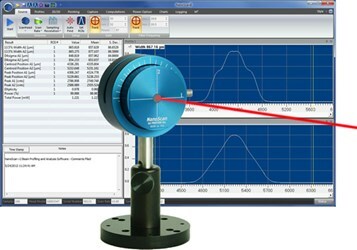 The NanoScan™ profiler uses the scanning slit technique to measure beam sizes ranging from microns to centimeters at beam powers from microwatts to kilowatts, often without attenuation. Beam sizes and beam pointing can be measured with a 2-sigma precision of several hundred nanometers due to the high accuracy and stability of the profiler. With an updated integrated software package for the Microsoft Windows Platform, and a software controllable scan speed. “Peak connect” algorithm measurements of pulsed and pulse width modulated lasers with frequencies of 10 kHz and higher are attainable. The NanoScan™ is capable of simultaneously measuring up to 16 beams, or regions of interest, within the aperture. For more on the NanoScan™ profiler’s capabilities, benefits, and specifications, download the datasheet.